Abstract: The memory that we'll be checking out today is Crucial's 2GB PC2-5300 Ballistix set of memory. Rated in a dual channel configuration at 667 MHz with default timings of 3-3-3-12. You see, the issue revolves around the AMD Athlon64's memory controller and how it calculates the memory operating frequency. To get the memory frequency, you have to divide the CPU frequency with an integer - a whole number like 133, or 200. For Athlon64 processors with an even clock multiplier, there isn't any problem running DDR-2 memory at DDR2-800 speeds. However Socket AM2 Athlon64 processors that happen to have odd number multipliers will need to do a few more steps. Pretty simple right? Here's where things start to get complicated. Now take a look at what happens with the socket AM2 AMD Athlon64 X2 5000+ processor, its multiplier is '13'. A value of 2600 MHz cannot be divided by an integer to result in 400 MHz, and a quick bit of math illustrates this: 2600 / 7 = 371 MHz, and 2600 / 6 = 433 MHz. To work around this the system selects the lower of the two frequencies because it is acceptable ro run memory at speeds lower than JEDEC standards, but not higher. This memory anomaly affects all Socket AM2 Athlon64 processors that are usng an odd number multiplier as the system tries to run memory at DDR2-800 speeds. It also affects how the situation plays out with other JEDEC standards like DDR2-400, DDR2-533 and DDR2-667. Now, on with the review! 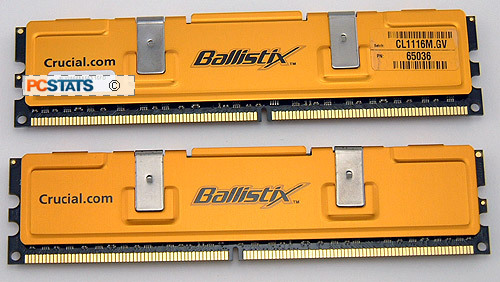 The memory that we'll be checking out today is Crucial's 2GB PC2-5300 Ballistix set of memory. Rated in a dual channel configuration at 667 MHz with default timings of 3-3-3-12, the memory comes with a price tag of $410 CDN ($369 US, £199 GBP) for this kit of two 1024MB modules. Crucial rates the Ballistix PC2-5300 memory to run with voltages as high as 2.2V, at that setting the memory can get quite hot and the heat spreaders are definitely a nice feature. If you plan to do some major overclocking, it's best to have abundant airflow inside your PC case. Crucial has years of excellent customer support and service under its belt, and while it has only recently gotten into the enthusiast market its expertise in dealing with the public is certainly positive. Tech support is easily integrated into Crucial's website, and the company has a database of memory related issues and solutions that comes in really handy should problems arise. On AMD test systems, we're only interested in seeing how high we can go with the memory running 1:1, as running with other dividers puts the overclocking bottleneck elsewhere and not with the system memory. The DDR2 RAM latency must run at its lowest possible setting, as quick access is more important to the CPU design. Just for arguments sake, we will also be conducting overclocking tests to see how high the memory will go with lax timings (5-5-5-15), although we will only benchmark the system with the tight memory timings mentioned above. Let's get started!